Croma’s new HA filler brand is Saypha. Croma HA filler range now consists of the following products: Saypha Rich, Saypha Filler, Saypha Filler Lidocaine, Saypha Volume, Saypha Volume Lidocaine and Saypha Volume Plus Lidocaine. Saypha Filler Lidocaine is a sterile gel that is used to correction of moderate facial wrinkles and lines as well as the enhancement of lip volume. For the correction of moderately severe wrinkles in forehead furrows, glabellar lines and to fill the lips, the product is injected into the mid to deep skin layer. Contains lidocaine. 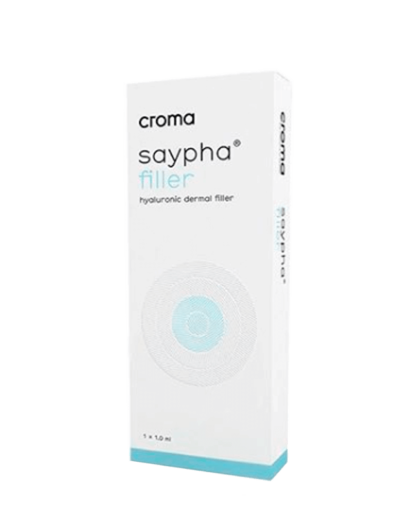 Saypha Filler is a sterile gel that is used to correction of moderate facial wrinkles and lines as well as the enhancement of lip volume. For the correction of moderately severe wrinkles in forehead furrows, glabellar lines and to fill the lips, the product is injected into the mid to deep skin layer. 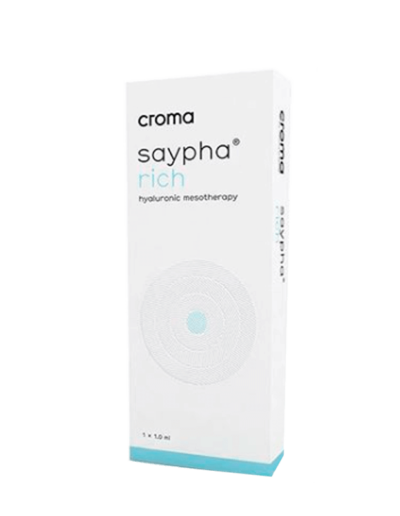 Saypha Rich is an isotonic and biodegradable gel that is used for mesotherapy treatment and the correction of superficial wrinkles in the the upper skin layer. Saypha Rich is based on the SMART technique which means the gel is not cross-linked but stabilised by glycerol, a natural moisturiser, which retains water and preserves hydration. 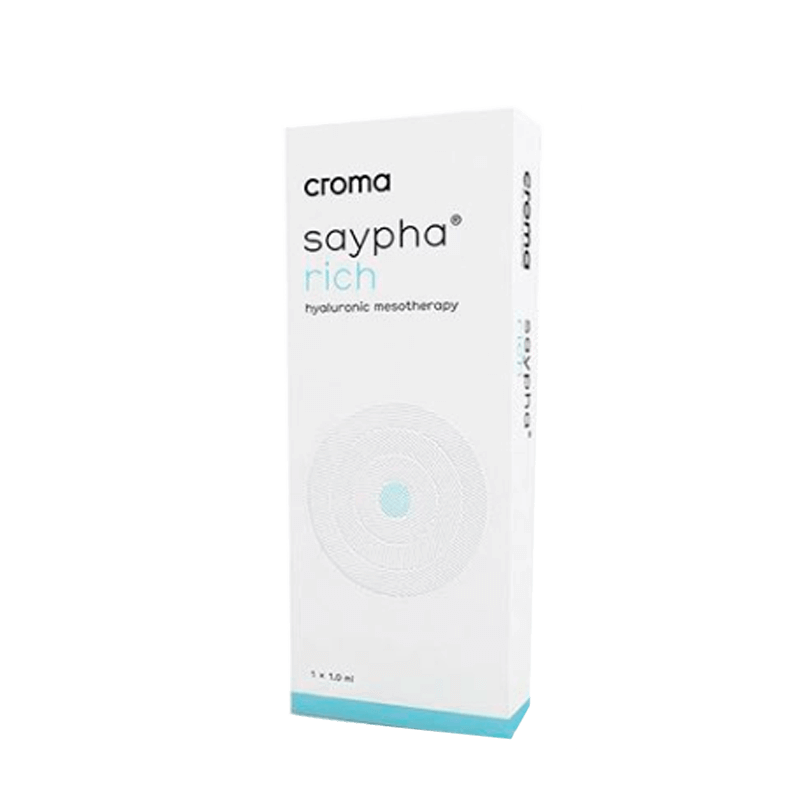 Saypha Rich contains a high concentration of hyaluronic acid (HA) and the combination of HA and glycerol durably increases the hydration of the skin. Saypha Volume Lidocaine is a sterile gel that is used to correction of deep wrinkles and folds, cutaneous depressions, facial contours and the creation of volume. Saypha Volume Lidocaine is being used in cheeks, nasolabial folds and marionette lines for building facial volume. Contains lidocaine. Saypha Volume Plus Lidocaine is ideal for volume enhancement, facial contouring and reconstructive treatment. The ultra-thin wall needles and added lidocaine causes less bruising and higher levels of comfort for the patient. It enables effective face modelling with visible, long-lasting and natural-looking results. Saypha Volume is a sterile gel that is used to correction of deep wrinkles and folds, cutaneous depressions, facial contours and the creation of volume. Saypha Volume is being used in cheeks, nasolabial folds and marionette lines for building facial volume.